This is one dish that takes me down the memory lane those carefree childhood days where Amma cooked and I ate and helped her. The reason I loved to help Amma for making Chitra Anna was the raw mango which was grated. She shouted at us if we ate while grating but always doled out some of the gratings in our outstretched hands. :-0. This is made especially for Ugadi or Gudi Padva, the Hindu New Year. And this year it was no different we had Chitra Anna as every year. But the big difference this year was the fact that both my daughters participated in the preparation of the Ugadi feast and the highlight was we ate on the banana leaves the girls specifically cut from the garden. The commotion that Akanksha was making while cleaning the leaves, her insistence that she wanted soap to clean the leaves and the patient explanation that her sister gave her that a clean dishcloth was enough and most importantly no sulking, no complaints and no referral to me is something that I will always treasure!! 1. Wash the rice and in add enough water and cook. The grains should be separated but well cooked. Cool and fluff the rice. 2. In a kadhai/wok add the oil and heat. Splutter the mustard, add the urid daal fry till it reddens. 3. Then add the groundnuts and fry till you get a pleasant aroma of fried groundnuts. Now add the red and green chillies, curry leaves, hing/asafoetida . Give a quick stir and add the cashew nuts. 4. Remove from flame add the rice, salt and mango grating. 5. Mix garnish with coriander and serve. Note: This an be made out of leftover rice also! 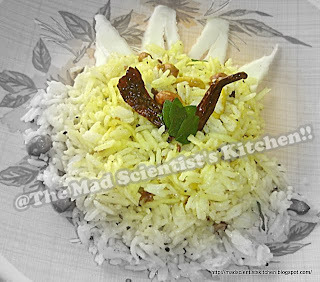 Tangy rice tempts me a lot..inviting..
love the rice and i love it with anything. Lovely recipe! Must be very tangy! 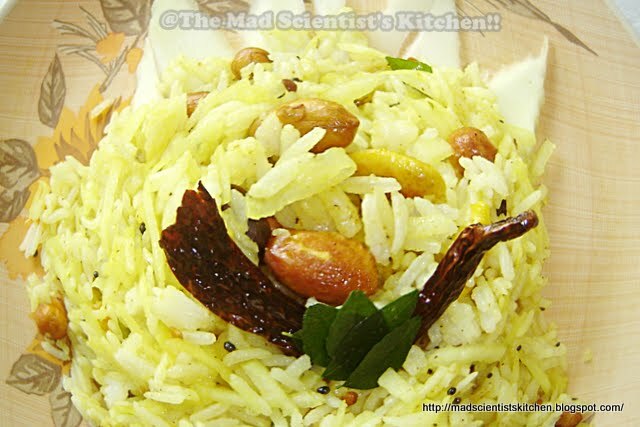 Its one delectable rice recipe !! !i had this roomie who used to make awesome mango rice…..but i have never made it myself!!! Your recipe looks quite easy to follow..and not to mention….mouth-watering too!!! Love the flavor of raw mangoes in it..simply delicious..
Love this anytime, any day..looks very tempting! Rice looks so tangy and delicious !! very tempting!….I am delaying in posting mine….would love to have it again! Love your comments girls. Please keep them coming!